How to set up an Internet Connection on ASUS Wireless WAN? 1. Enter the IP address of your device in the browser, followed by your username and password to login to your ASUS networking device. ASUS Wireless Routers use a web-based user interface that allows you to configure the router by any web browser, such as Internet Explorer, Mozilla Firefox, Apple Safari, or Google Chrome. The Quick Internet Setup function guides you to quickly set up your Internet connection. 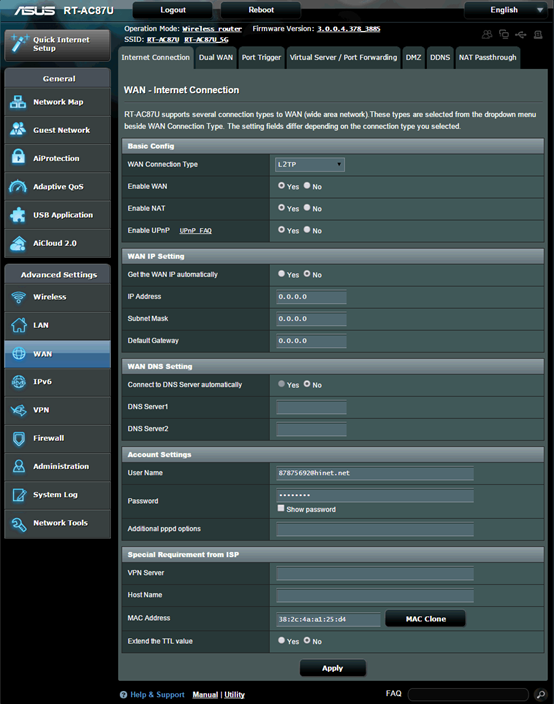 The wireless router automatically detects if your ISP connection type is Automatic IP, Static IP, PPPoE, PPTP and L2TP. Key in the necessary information for your ISP connection type. IMPORTANT: Obtain the necessary information from your ISP about the Internet connection type. 3. If you need detailed setup information, go to the WAN- Internet Connection. 4. There are 5 WAN connections to choose from : Automatic IP, Static IP. PPPoE, PPTP, L2TP. Enable WAN: Enable and disable WAN. Under some connection types, you can get a new IP address by using Enable and Disable WAN. Enable NAT: NAT(Network Address Translation) is a process used in routers to replace the address information of network packets with new address information. 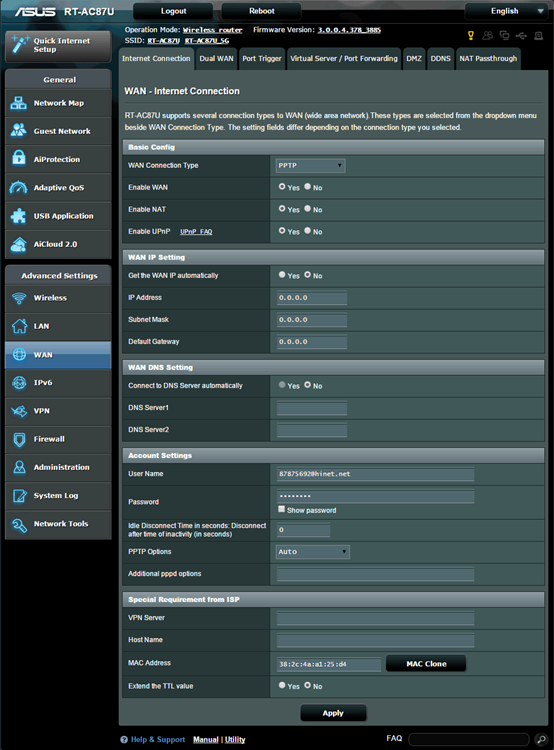 Typical applications for NAT is for routers which connect to LAN with the WAN. In LAN, every network device had a private IP (LAN IP) but there’s only one public IP (WAN IP). To grant internet access to the network devices, the router replaces the private IP address of the sender with its own public IP address in all outgoing data packets. The router saves all necessary information in a table (NAT table) so that incoming data packets can then be assigned to the correct network device. Enable UPnP: UPnP(Universal Plug and Play) allows several devices(routers, televisions, stereo systems, game consoles, cellular phone) to be controlled via an IP-based network with or without a central control through a gateway. 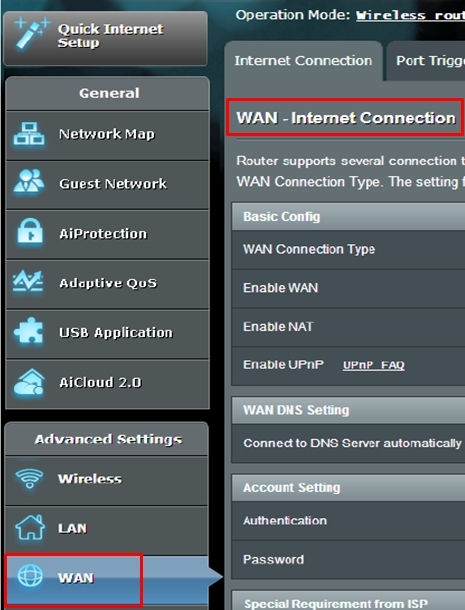 Connect to DNS Server automatically: Allows this router to get the DNS IP address from the ISP automatically. Authentication: This item may be specified by some ISPs. Check with your ISP and fill them in if required. 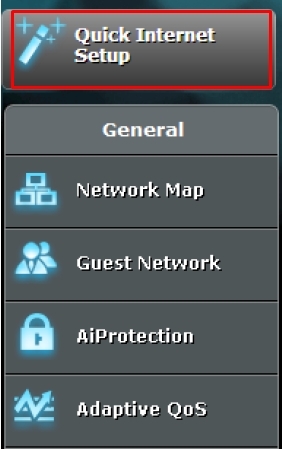 Host Name: You can provide a host name for your router. It’s usually requested by your ISP. * Contact your ISP and request to update the MAC address associated with your ISP subscription. * Clone or change the MAC address of the new device to match the MAC address of the original device. DHCP query frequency: Some Internet Service Providers block MAC addresses if the device makes DHCP queries too often. To prevent this, change the DHCP query frequency. In the default Aggressive mode, if the router does not get a response from the ISP, it sends another query after 20 seconds and then makes three more attempts. In Normal mode, if the router doesn’t get a response from the ISP, it makes a second query after 120 seconds and then makes two more attempts. Enable WAN: Enable and disable WAN. Under some connection type, you can get a new IP address by enable and disable WAN. Enable NAT: NAT(Network Address Translation) is a process used in routers to replace the address information of network packet with new address information. 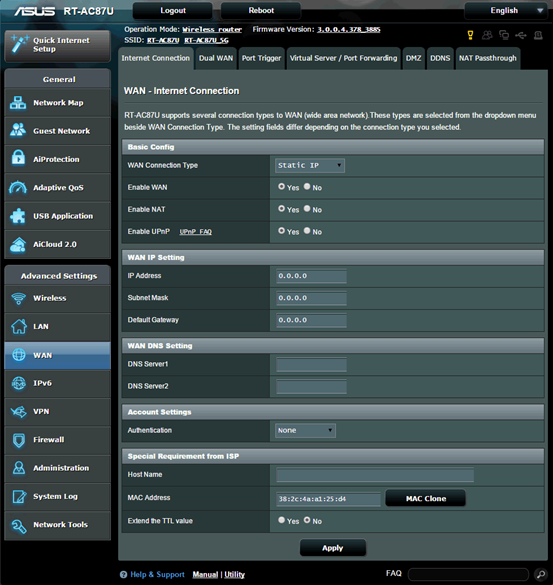 Typical applications for NAT is router which connect to LAN with the WAN. In LAN, every network devices had a private IP(LAN IP) but there’s only one public IP(WAN IP). To grant the network devices access to internet, the router replaces the private IP address of the sender with its own public IP address in all outgoing data packets. The router saves all necessary information in a table(NAT table) so that incoming data packets can then be assigned to the correct network device. IP Address: If your WAN connection requires a static IP address, key in the IP address in this field. Subnet Mask: If your WAN connection requires a static IP address, key in the subnet mask in this field. Default Gateway: If your WAN connection requires a static IP address, key in the gateway IP address in this field. DNS Server: This field indicates the IP address of DNS that the router contacts to. Authentication: Some Internet Service Providers block MAC addresses if the device makes DHCP queries too often. To prevent this, change the DHCP query frequency. In the default Aggressive mode, if router does not get a response from the ISP, it sends another query after 20 seconds and makes three more attempts. In Normal mode, if router doesn’t get a response from the ISP, it makes a second query after 120 seconds and makes two more attempts. 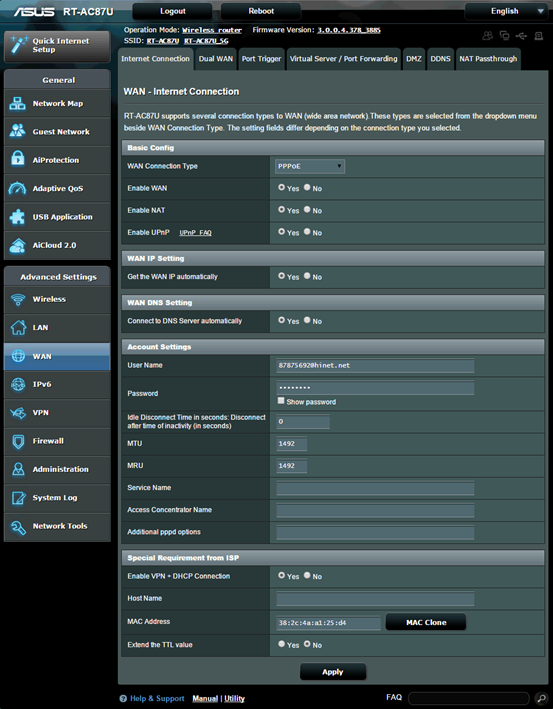 Get the WAN IP automatically: Allows the router to get the WAN IP address from the ISP automatically. User Name: Fill-in the information which ISP provided. Password: Fill-in the information which ISP provided. Idle Disconnect Time in seconds: Disconnect after time of inactivity (in seconds): This field is optional and allows you to configure to terminate your ISP connection after a specified period of time. A value of zero allows infinite idle time. MTU: The Maximum Transmission Unit(MTU) of PPPoE packet. The default value is 1492. Change this value only if your ISP requires it. MRU: The Maximum Receive Unit(MRU) of PPPoE packet. The default value is 1492. Change this value only if your ISP requires it. Service Name: This field is optional and may be specified by some ISPs. Check with your ISP and fill them in if required. Access Concentrator Name: This field is optional and may be specified by some ISPs. Check with your ISP and fill them in if required. Additional pppd options: This item may be specified by some ISPs. Check with your ISP and fill them in if required. Enable VPN + DHCP Connection: Decied you want to enable VPN and DHCP connection or not. User Name: Fill-in the information which ISP provided. This filed is only available when setting the WAN Connection Type as USB Modem, PPPoE, PPTP or L2TP. Password: Fill-in the information which ISP provided. This field is only available when setting WAN Connection Type as PPPoE. PPTP Options: This item may be specified by some ISPs. Check with your ISP and fill them in if required. VPN Server: If your WAN connection type is PPTP or L2TP, please enter the server name or server IP of the VPN Server. 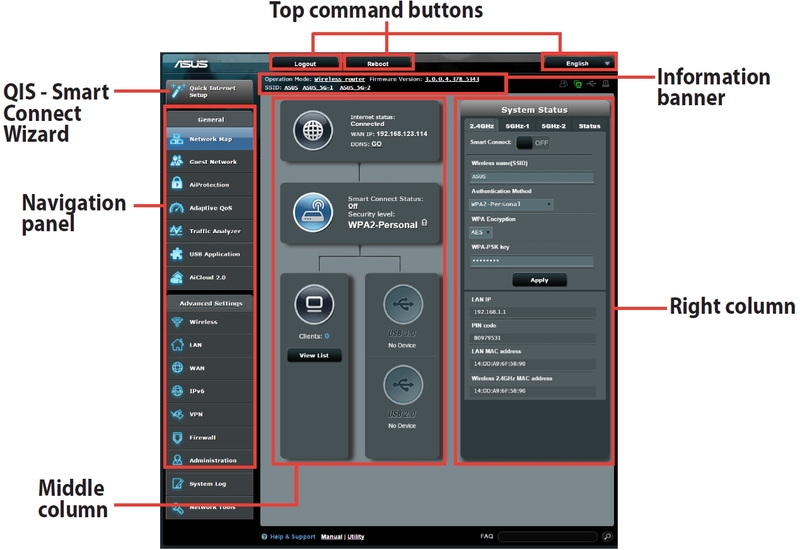 How to enter the ASUS Wireless Router’s GUI (ASUSWRT)? ※ NOTE: When you login to the Web GUI for the first time, you will be automatically directed to the Quick Internet Setup (QIS) page. 1. Enter the IP address of your device in browser, then key in your username and password to login in your ASUS networking device. ASUS Wireless Router uses a web-based user interface that allows you to configure the router by any web browser, such as Internet Explorer, Mozilla Firefox, Apple Safari, or Google Chrome. 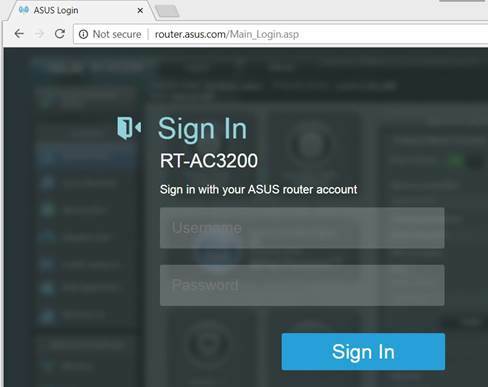 If you don’t know the IP address, type: http://router.asus.com in your browser for ASUS router models. If you forgot the router IP address, please refer to the Asus Device Discovery Utility shown below to find the IP address based on your operating system. ※ Note: The default username and password used to login to the router settings page are NOT the SSID and password used to connect wirelessly to the router. ※ Note: If you forgot the user name and/or password, please restore the router to the factory default status. Please press and hold the hardware reset button of the router for at least 8 seconds to reset the device. You can find the Hardware Reset Button of router as shown below. 3. 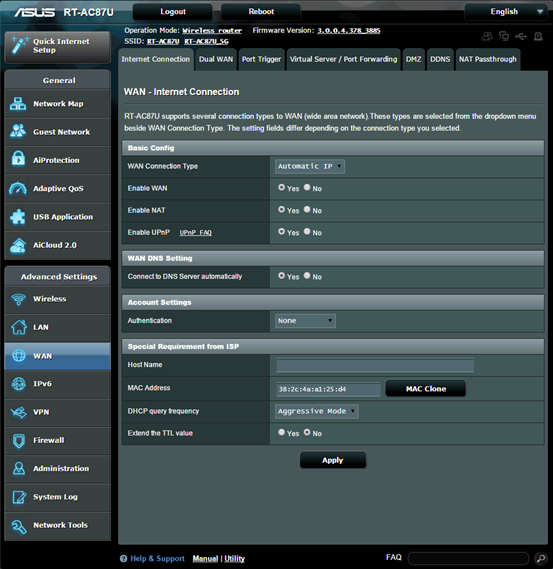 Now you can use the Web GUI to configure the settings of your ASUS Wireless Router. ※ NOTE: Some features may vary due to different firmware versions.